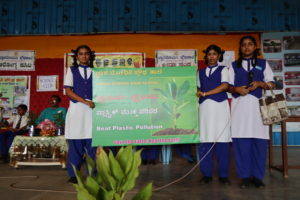 Dubasiplaya is a sub-locality of Kengeri Satellite town at a distance of 17 kilometers from Bangalore City on the Bangalore – Mysore State Highway. The name Kengeri comes from the words tengu coconut and Keri meaning place. The place is still surrounded by coconut farms. 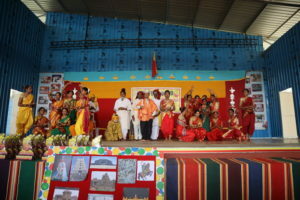 In the past it was ruled by a number of dynasties including the Gangas followed by the Cholas. During Tippu Sultan’s reign Kengeri was a famous centre for sericulture industries. A memorial building had been built at the premises of the Kengeri Gurukula Vidya Peetha to commemorate the visits of Gandhiji. Now Kengeri is part of Brahat Bangalore Corporation. It has an average literacy rate of 75% which is higher than the national average of 59.5%. 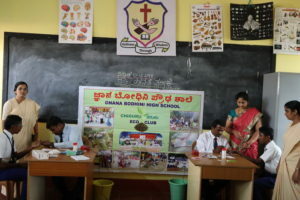 Gnanabodhini Institutions are located at Dubasipalya near Kengeri. Mother Genevieve Castelino, Superior General of Ursuline Franciscan Congregation bought the land in Gollarahatti for the Ursuline Franciscan Educational Society in 1967. 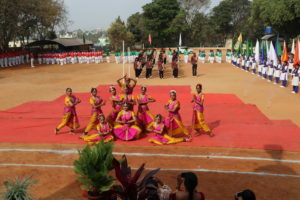 It is at a distance of one kilometer from Gnanabodhini Higher Primary School. 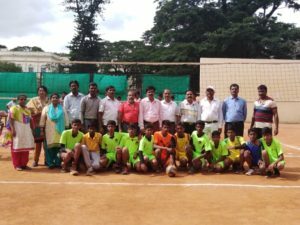 ‘Jnanabharathi’, Bangalore University, Government Press and National Institute of Sports are its good neighbors. The Ursuline Franciscan Sisters’ hallmark is preferential option for the poor. 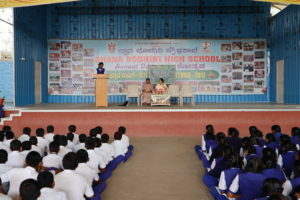 Keeping in mind the commitment “access to education especially of and for the poor”, Gnanabodhini Kannada High School was started in 1985 for the rural poor and Gnanabodhini English High School was started in 1988 to provide education in English Medium to the students of rural area. 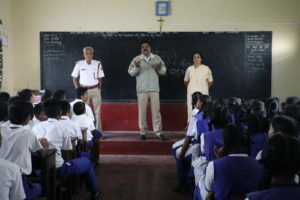 Fr Pancratius Pinto OFM (Cap) was the first headmaster (1985-86) followed by Sisters Therese D’Souza ( 1986-92), Emily D’Souza (1992-98), and Veena D’Souza (98-2011). The Institution is grateful for their relentless efforts in bringing it up. In 2011 Sr Therese D’Souza held the baton again until 2014.From then onwards till now Sr. Jacintha Pereira is heading the schools ably. 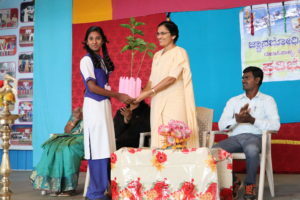 Sr Jacintha Periera, M.A, B.Ed born in Belthangady in D.K District in Karnataka. 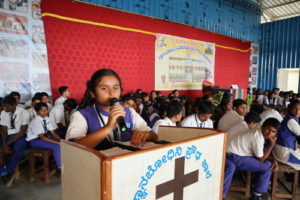 Early education was in Church higher primary school and high school in St.Theresa High school Belthangady. 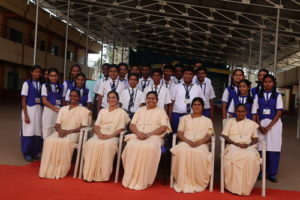 Studied P.U.C at St.Agnes college Mangalore. There after B.A degree from Osmania university Hyderabad. 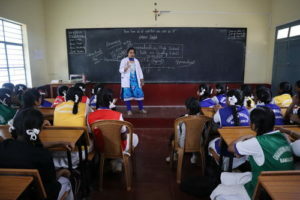 Professional studies B.Ed from St.Ann’s college of education mangalore. 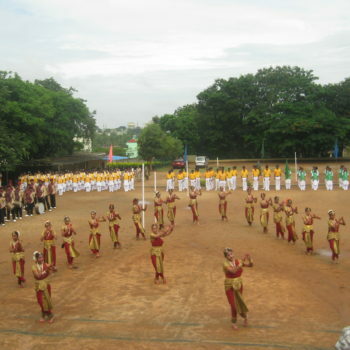 M.A degree from Karnataka open university Mysore. Short courses and seminars at Vishwadeep and NBCLC Bangalore. One year Diploma course in spirituality at Siddhivihara mysore. 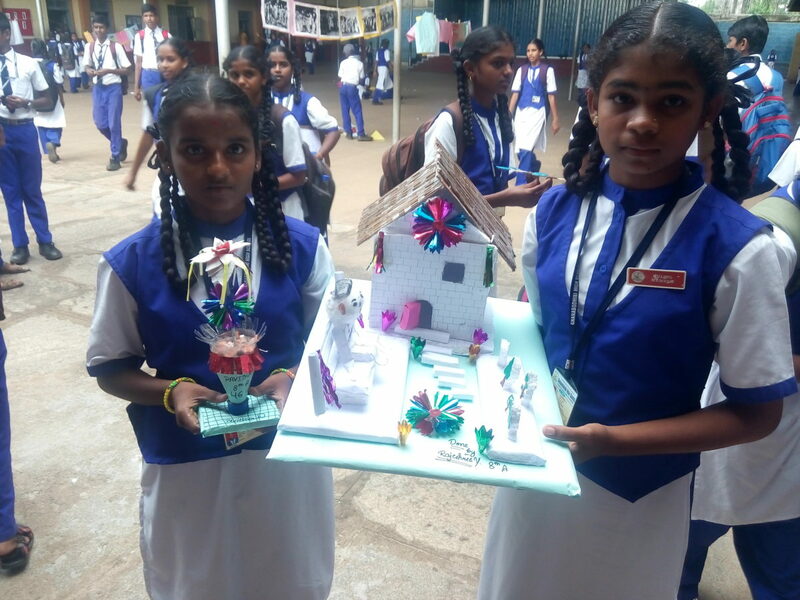 Though not received any award from the department, it doesnot mean that our achievement in the field of education is no less than the great achievers. 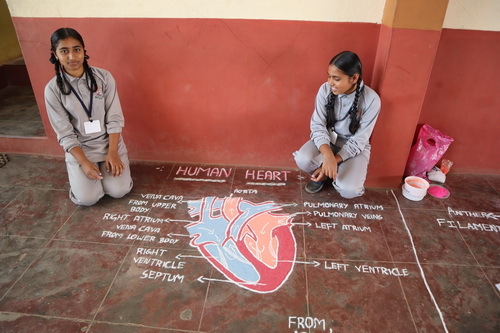 I have won the heart of the parent and the students throughout my teaching career. 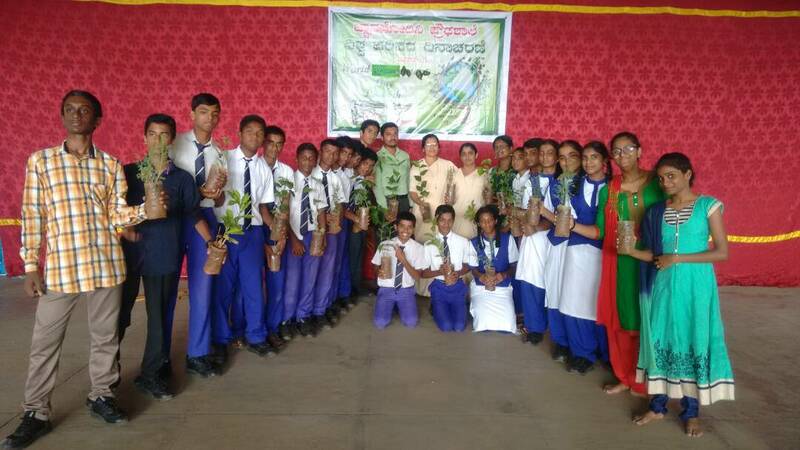 The students have learnt good values for their life and the many of the students are the best examples who are an assets to the society. The education mission is a great challenge today in the present context. In this challenging time we need to keep standby on our toes with latest updates. 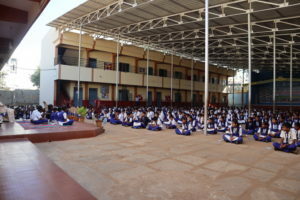 Nagadevanahalli is a part of Brahat Bangalore Corporation. Gollarahatti is a hamlet in Nagadevanahalli. 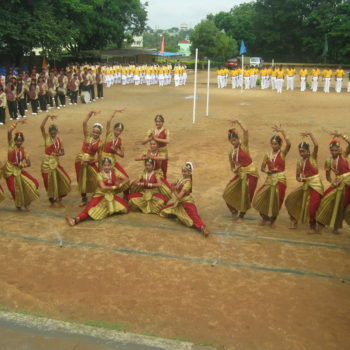 The villagers around are known as KaduGollas. Mother Genevieve Castelino bought the land in Gollarahatti in 1967 for the Ursuline Franciscan Educational Society when she was the Superior General. 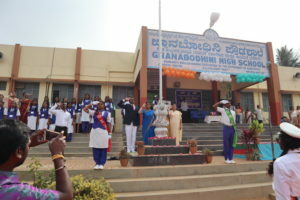 It is at a distance of one kilometre from Gnanabodhini Higher Primary School. 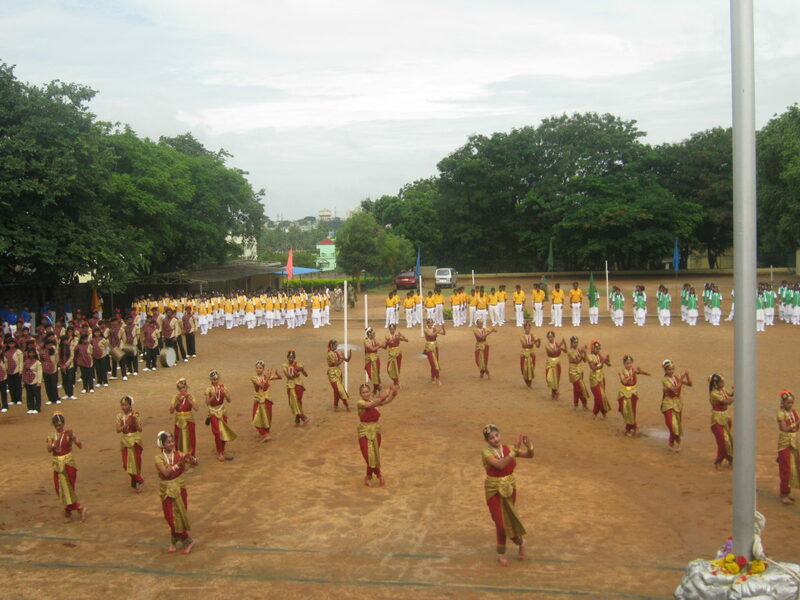 ‘Jnanabharathi’, Bangalore University, Government Press and National Institute of Sports are its good neighbours. The Ursuline Franciscan Sisters’ hallmark is preferential option for the poor. 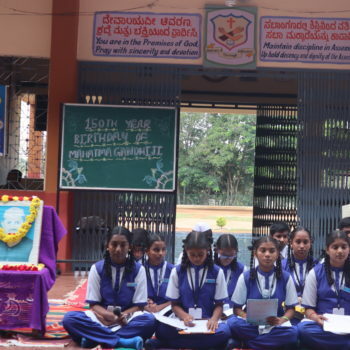 Keeping in mind the commitment “access to education especially of and for the poor”, Gnanabodhini Kannada High School was started in 1985 for the rural poor. FrPancratius Pinto OFM Cap. 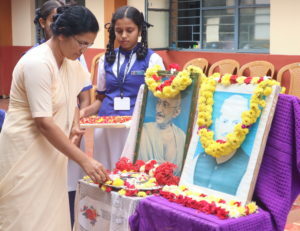 was the first headmaster (1985-86) followed by Sisters Therese D’Souza ( 1986-92), Emily D’Souza (1992-98), and Veena D’Souza (98-2011). The Institution is grateful for their relentless efforts in bringing it up. 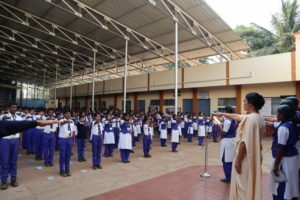 Since 2011 Sr Therese D’Souza is holding the baton again. For nearly a decade the High School took shelter in the Holy Family Convent building. 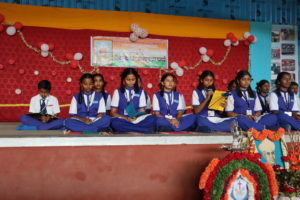 In 1995 the School was shifted to Gollarahatti since in the Higher Primary School the number of students as well as activities showed considerable growth as the years passed by. The Holy Family campus could not sustain this; and the High School students needed more space. 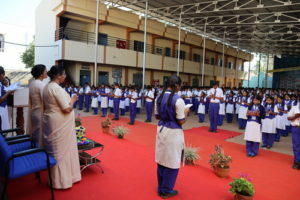 Therefore the Management decided rightly to shift the High School to Gollarahatti. 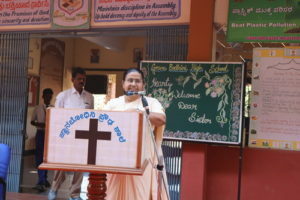 Sr Emily D’Souza, the then headmistress, constructed the school building. The cost of construction was funded by the Generalate. In 1987 the Government notified the acquisition of the land for a private housing society. 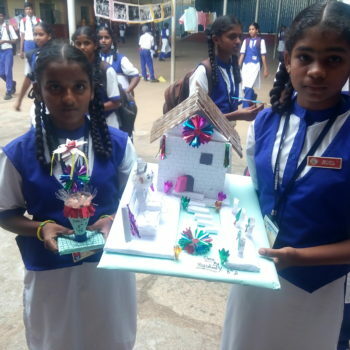 The laborious efforts of Sr Gemma and Sr Lilly Pinto who ran from pillar to post to have the land de-notified, saved the School from further problems. Now this area comes under Brahat Bangalore Corporation limits. 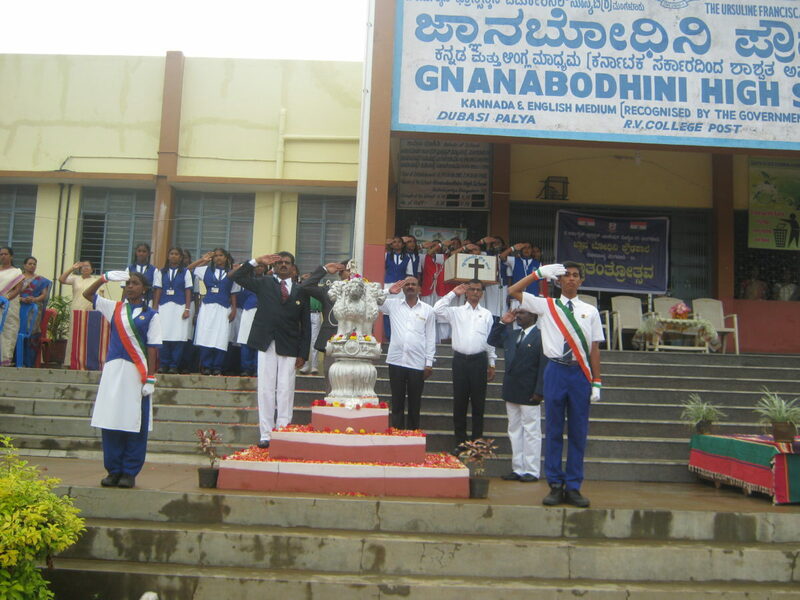 Gnanabodhini Kannada High School is one of the best schools in the area. 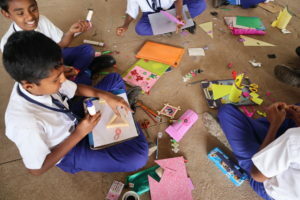 It has a good infra- structure, a large playground, digital class rooms, computer lab, science lab, and a good library. 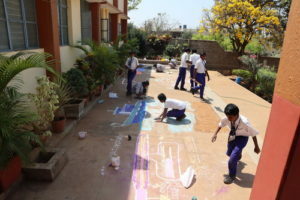 The campus is ever green and clean giving a beautiful face to the School. 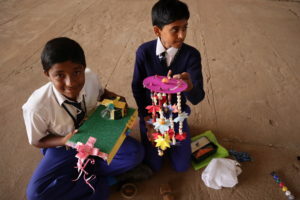 Being away from the hustle and bustle of the city, it can claim a conducive atmosphere for learning as its other specialty. 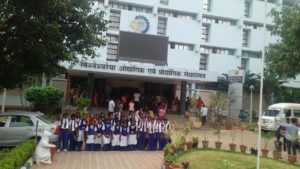 The Institution prepares students not only for better careers in life but also finds ways and means to make the students a strong hope of our future society. 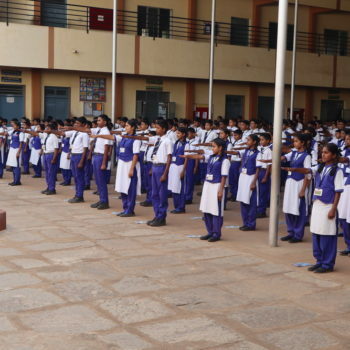 1,165 students have passed out from the portals of this School with flying colours. 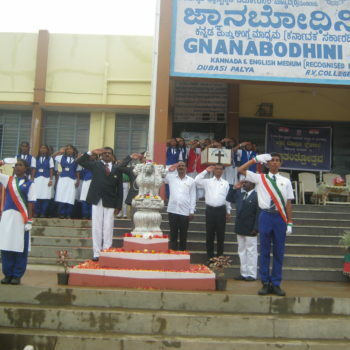 Gnanabodhini English Medium High School was established in the year 1988. 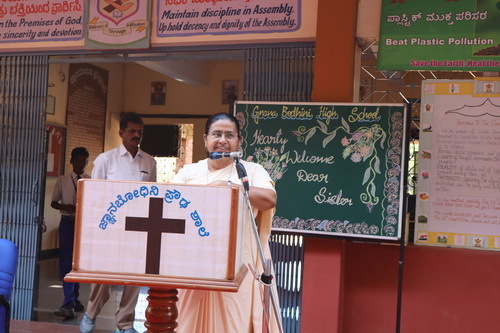 Sr Therese D’ Souza, was the first headmistress. She is a woman of few words but with a fine spirit of hope and achievement. The staff was equally talented and committed; this contributed greatly to the improvement of the School. 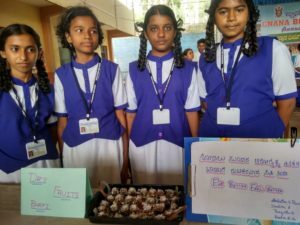 Her successors Sr. Emily D’Souza and Sr. Veena D’Souza both undaunted personalities during their term as headmistresses left no stone unturned for the all-round growth of the School. 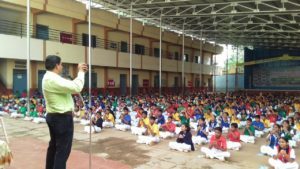 The overcrowded classrooms had to be bifurcated and additional classrooms needed had to be constructed to accommodate the students. 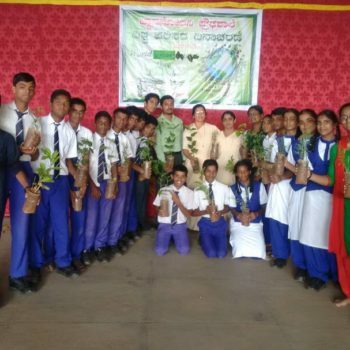 Sr. Veena not only attended to this need effectively but also built a multi-purpose open auditorium which is a glowing proof of her foresight and competence. 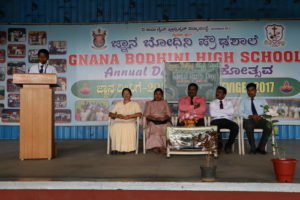 Gnanabodhini High School, rendering Yeomen services to the society through its educational activities since 1985, has turned 25 and celebrate its Silver Jubilee in 2010. 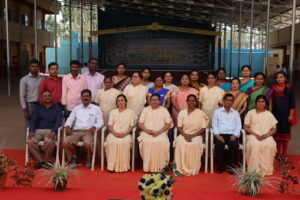 The celebration was marked with 25 years fruitful service to the society with the finale on 15 th December 2010. It was graced by Archbishop of Bengaluru Rt. Rev. Dr. Bernad Moras and Miss Shobha Karandlaje the then minister for power. 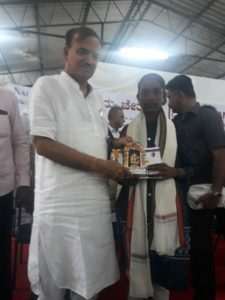 A magazine “Gnana Sambrama” was released in memory of Silver Jubilee celebration. 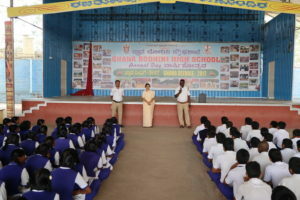 The school open hall was furnished with the sheet roofing with the financial help of the parents and the old students in the year 2009-10.Sr.TheresaD’souza the Headmistress of the school(2011-2014) seeing the increase in admission for English Medium, started one more additional section in June 2011. 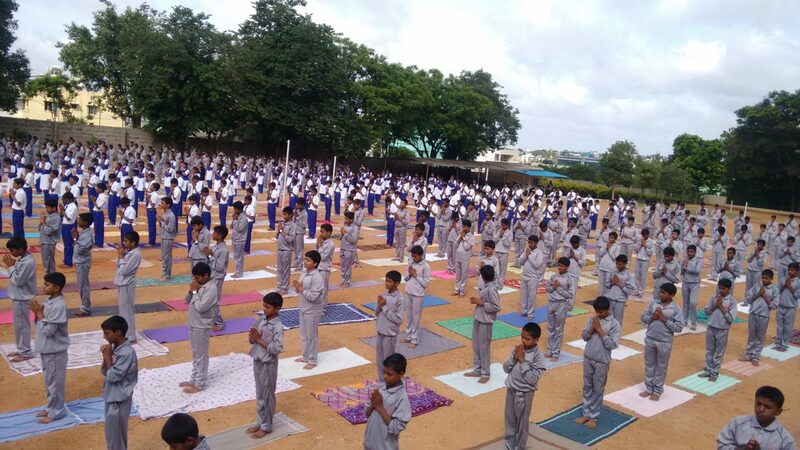 Since then 8 th 9 th and 10 th std begin to have two sections each. 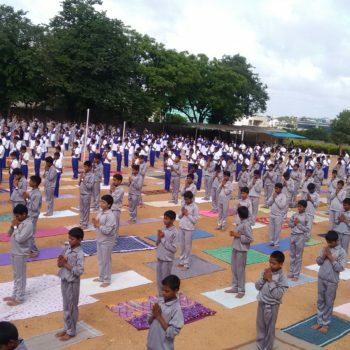 The school has gained applauses from Education Department and the public for moulding the students in discipline as well as good sports persons. 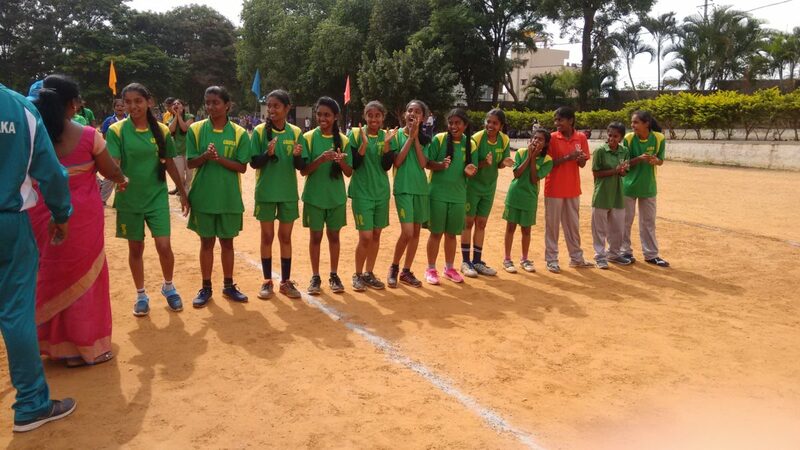 The school Volleyball team has represented Karnataka State and played at the national level in the year 2012. 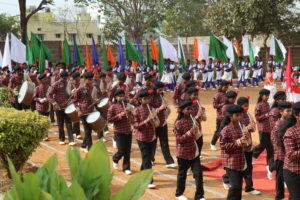 The school has well equipped Band set which is awarded as the best Band set in Bengaluru South District by the Education department and the public. 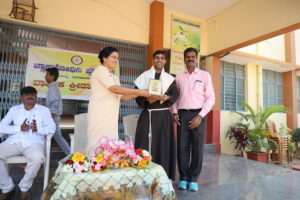 Mr.Chauriraj, MA, B.Ed was awarded the Best Teacher in 2013 by the Department of Public Instruction and the Diocese of Bengaluru for his excellent service towards education. 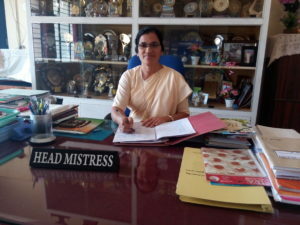 After the retirement of Sr.Theresa D’souza in April 2014, Sr. Jacintha Pereira took over the administration as Headmistress of the school in June 2014. 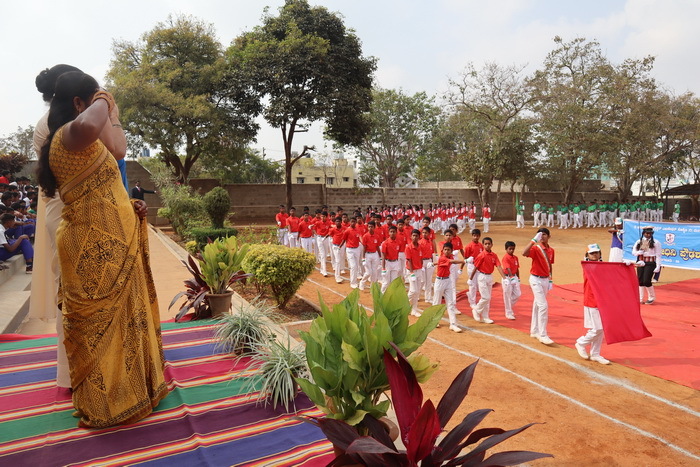 Under her able leadership the school excelled in curricular and co-curricular fields. 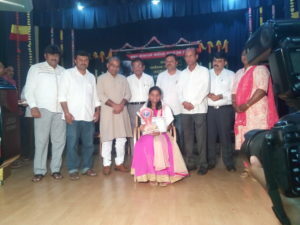 In 2014-15 our student Swetha S. Scored 618 out of 625 in S.S.L.C exam, the best ever individual score in the history of the school. 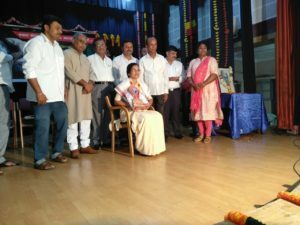 She was honoured by the school management. 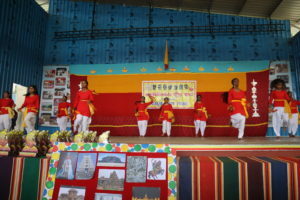 The need for improvement and upgrading the modern facilities was felt. 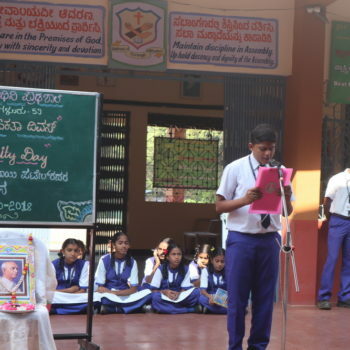 In this regard for qualitative education and to meet the demands of the digital world the school has began smart class room in 2016 and additional computer lab with 15 computers for Kannada Medium Section. For safe and clean drinking water facility R.O water purifier plant was installed. 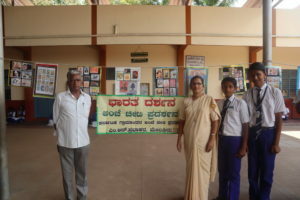 It was donated by our old student (Mr.Reddy). 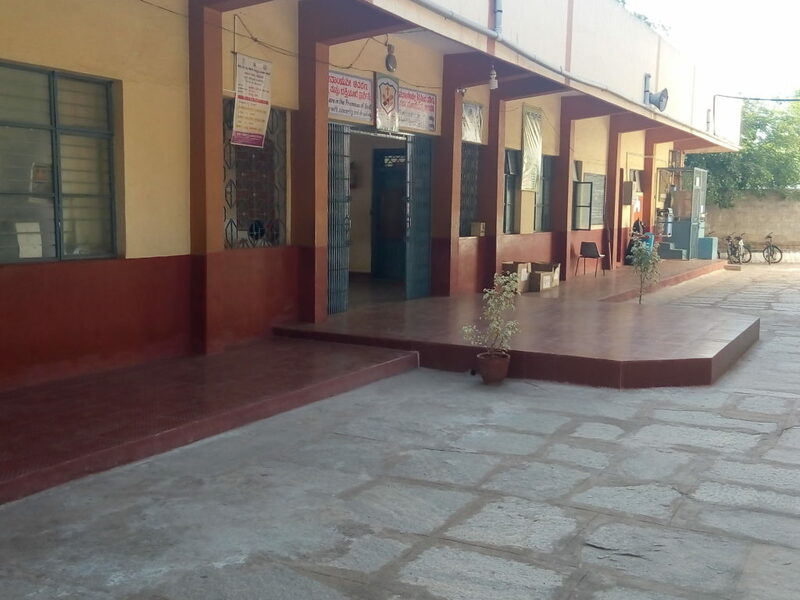 A new toilet block for boys was added to the structure in the year 2016. The Ursuline Franciscan Blooms (UFB) unit was started in the school on Dec 8 th 2016. 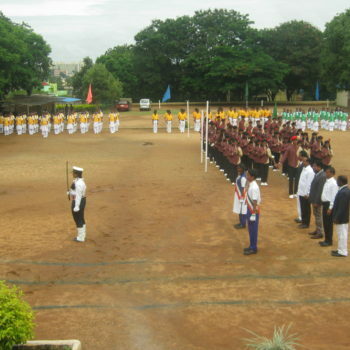 The catholic students are members of this unit. 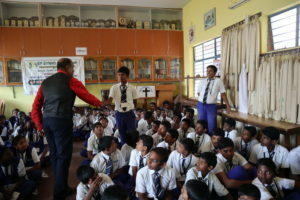 Special attention is given to these students to form them in catholic faith formation, values based and disciplined persons. 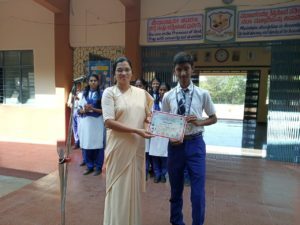 It was a great honour for the school when the top scorer of the school in S.S.L.C exam in 2017 April, Akshay L (616/625) was facilitated by the UFES at the Generalate on May 25 th 2017 during the 34 th General Body Meeting . In 2017 the school was awarded a certificate by CBCI (Delhi) for imparting value based education based on the gospel values. 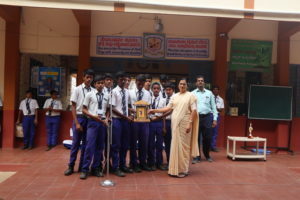 ‘The Best School’ award for SSLC results is the hallmark of Gnanabodhini. Committed, enthusiastic, cooperative and talented staff is behind such successes and achievements. 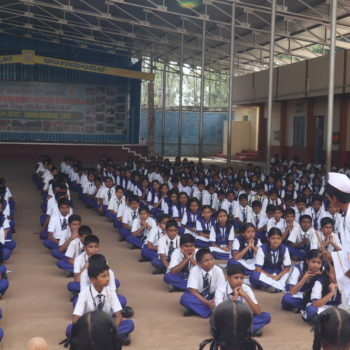 1,643 students have passed successfully through the Institution. 354 are pursuing their education presently. The need of the hour is to convert the land and regularize the unauthorized buildings and aim for a Pre University College. The Institution fosters good neighborly relations with those in the neighborhood, and with civil and public authorities. It promotes harmony and spirit of common brotherhood among all the people, transcending diversities based on religion, language, caste and gender, helping to cultivate the many qualities and attitudes mentioned among the fundamental duties of every citizen marching on with grace and success. 02.02.2019: “The personal Health and Hygiene workshop” was conducted for the girls of 8th and 9th by Dr. Priyanka. 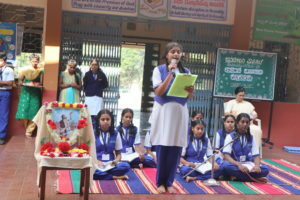 She emphasized on good personal hygiene. It can reduce a risk of many social, mental and health problems. 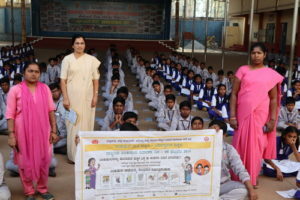 07.02.2019 : National D-worming day was observed on 7th February. 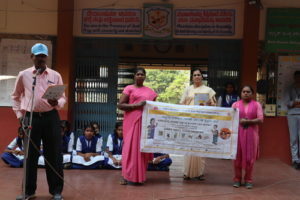 Ullalu Primary health center Asha workers Mrs. Shashikala and Shilpa were there to enlighten our students regarding the problems caused by worms. 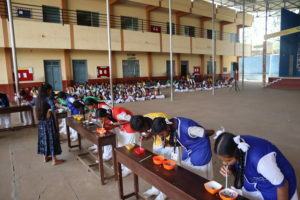 To prevent children from becoming anaemic tablets were distributed to students. 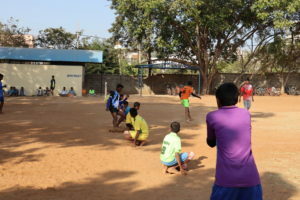 07.02.2019: Volleyball and Kho-Kho Tournament was conducted by Sports Authority of India on 7th February 2019 in SAI Grounds. 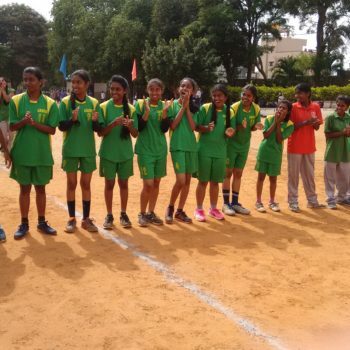 Our school Volleyball and Kho-Kho teams participated. 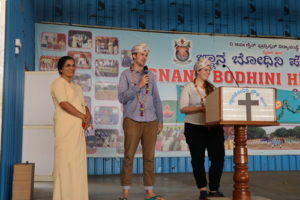 12.02.2019: A group of 15 German students (Theology) along with Professor came to our school to witness the Indian cultural dance performance- Bharathanatyam, kolata and kamsale. They were on tour to India visiting Churches, mosques and temple etc to study Indian culture. Fr. Vincent OFM Cap brought them to our school. 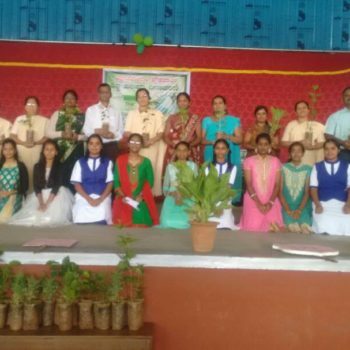 15.02.2019: The summer Parliament session was held on 15th February 2019 at 2.30 p.m. the chief judge was Mr. Babu Bhaskar V.R who is Alumni of our school. 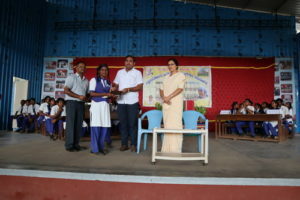 The prizes were distributed for the best Parliament members. 18.02.2019: A tribute was paid to the Soldires Mr. Guru and others who died in Pulwama terror attack. It’s their bravery, courage, best skills, perfection and Excellency that made them special and eligible to serve our motherland. 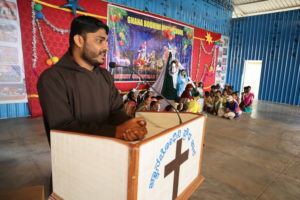 22.02.2019: The President of Urusiline Franciscan Educational Society very Rev. 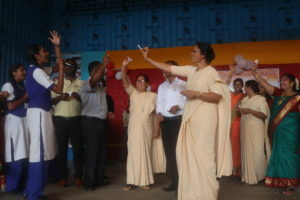 Sr. Susheela Sequeira. U.F.S. 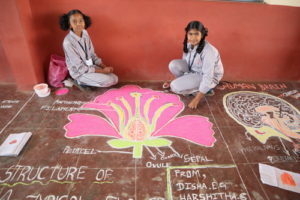 paid a loving visit to our school on 22nd February Thursday. 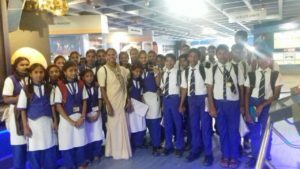 We the Headmistress, staff and the students were delighted by her presence. 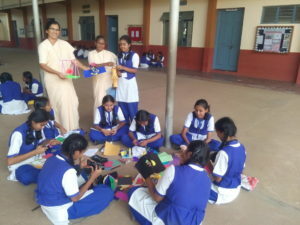 She was welcomed by our Headmistress Sr. Jacintha perira. 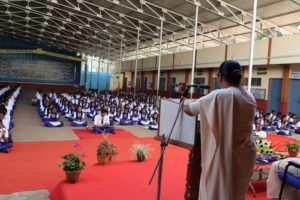 Students were enlightened by her thought provoking message. 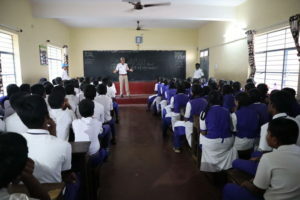 She met the staff of the school. 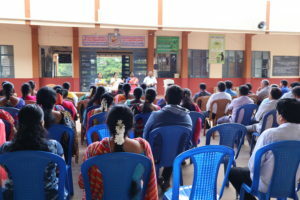 18-22 .02.2019: Slow learners students parents were called to the school to see the progress of their children. 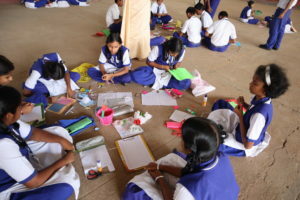 The teachers gave them guidelines to study, special classes in the evening and if they don’t pass in the final exam, they would be coming to school in the month of April 2019 for remedial classes. 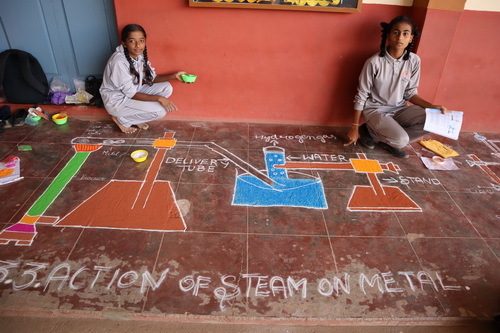 28.02.2019: National science Day celebrated in the school. 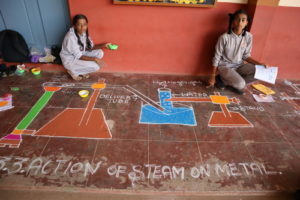 The achievements of Dr. C V Raman were highlighted through the speeches. 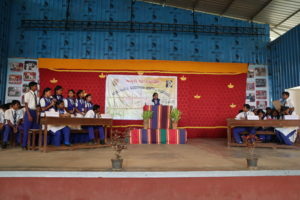 The quiz programme was conducted on the spot during the assembly. 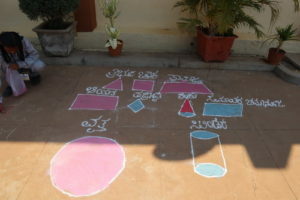 Rangoli competition was held. 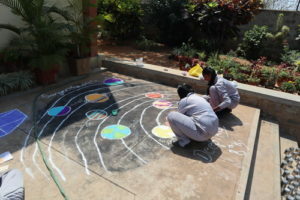 Models and Mathematical diagrams were drawn through Rangoli. A good response from the students for these activities was remarkable. 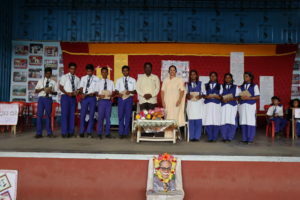 The certificates and prizes awarded to the winners. 02.1.19: The New Year began with a prayer service invoking the blessings of God on all of us. 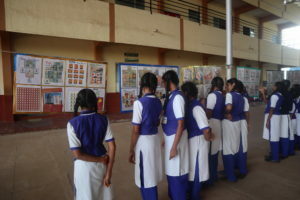 It was conducted by the students under the animation of Sr. Bindu. 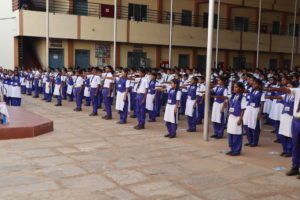 04.1.19: Career guidance and personality development classes were given to S.C & S.T students of our School by the BBMP personal. 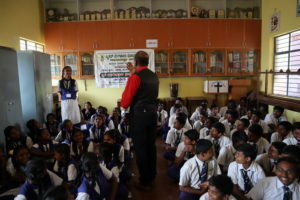 More stress was given on personality development and to face challenges of life. 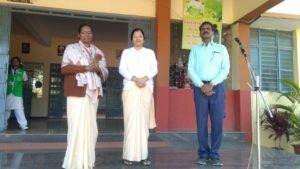 05.1.19: Sr. Bindu is elected as the deputy secretary of the province. 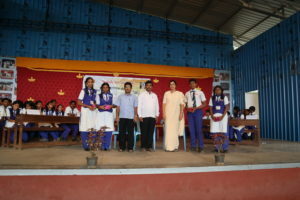 She was congratulated and honoured by the Headmistress, staff and Students ofn Gnanabodhini High School. 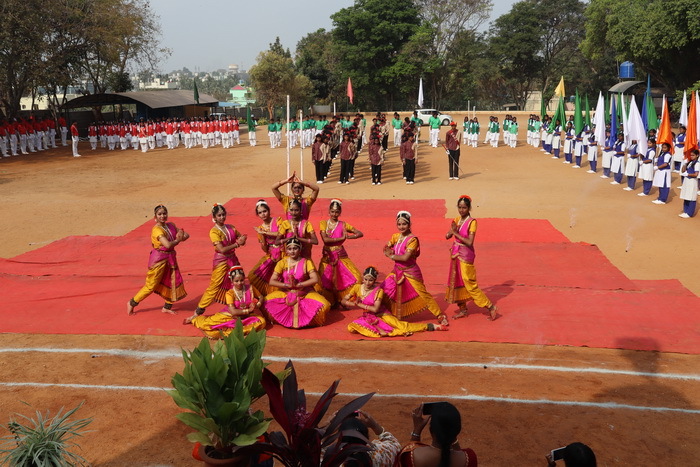 17.1.19: Annual Sports day was held on 17th and 18th January 2019, with great zeal, excitement and frolicsome atmosphere. 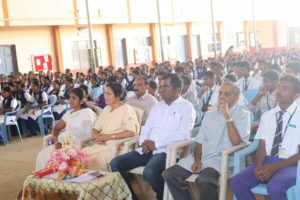 The chief guests were Rev. Fr. 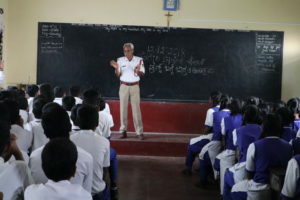 Roshan Rosario, The Principal of St. Antony P U College, and Mr. Sathya Narayana. 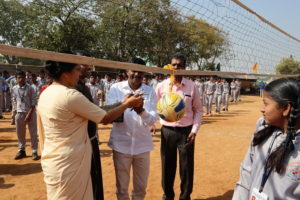 They emphasized on the importance of sports in a child’s life. 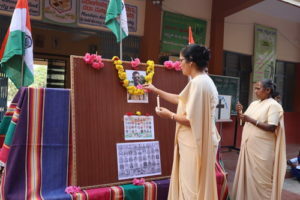 25.1.19: The National Voters day was celebrated in our school to spread awareness about the necessity of Voting and to encourage young generation towards the Voting rights. 2 Students gave the significance of the day through their speech. 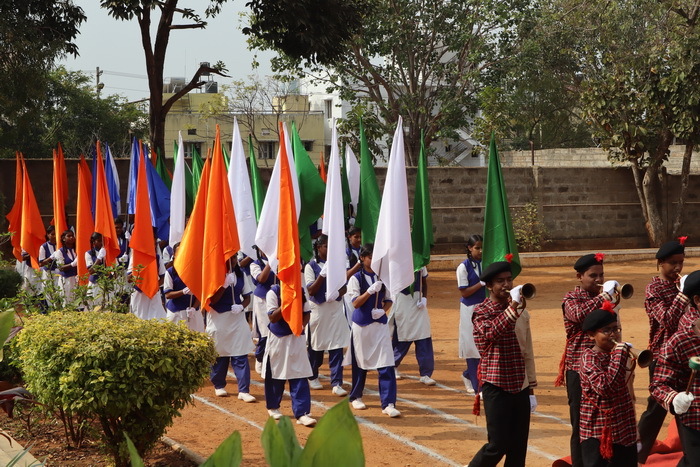 25.1.19: India’s 70th Republic day was celebrated today with great reverence in our School. 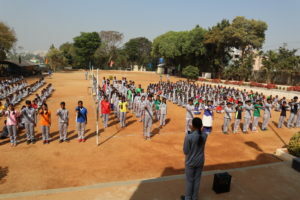 The programme began with a prayer dance followed by flag hoisting by the Guest of Honour Mrs. M.L Madhu Kumari Vagish a member of Bruhat Bengaluru Mahanagara Palike (BBMP). 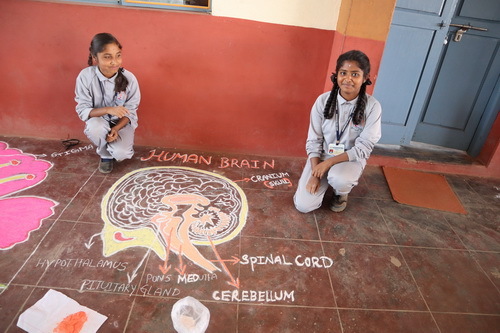 She is Alumini of our School. 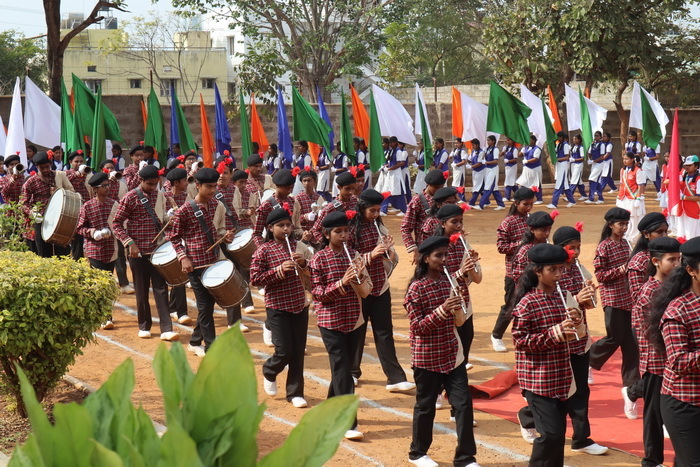 It was followed by Parade, melodious patriotic songs and inspiring speeches. 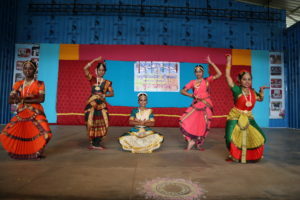 The Students and parents participated whole heartedly. 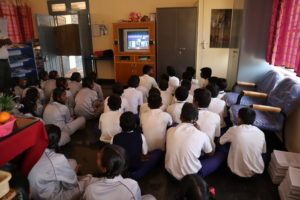 29.1.19: The Students had the opportunity to listen to the Prime Minister in the programme called “ Pariksha pe Charcha”. 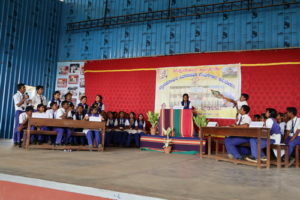 The Prime Minister was answering the questions of the Students, how to face the Exams. 01.12.18: The School PTA executive members had a meeting in the School to discuss about the programs and the academic progress of the Students. 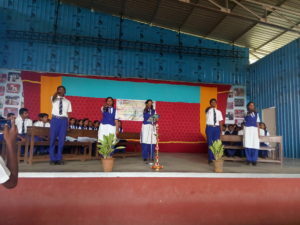 10.12.18: Awareness programme on prevention of HIV/AIDS was organized by eco club. 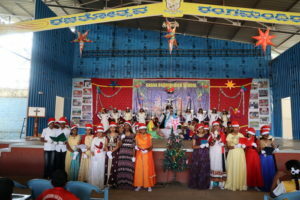 It was held on 10th December 2018. 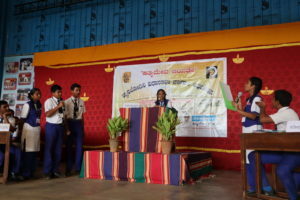 Dr. Soumya Krishnappa enlighted the Students and made them aware on HIV/AIDS disease. 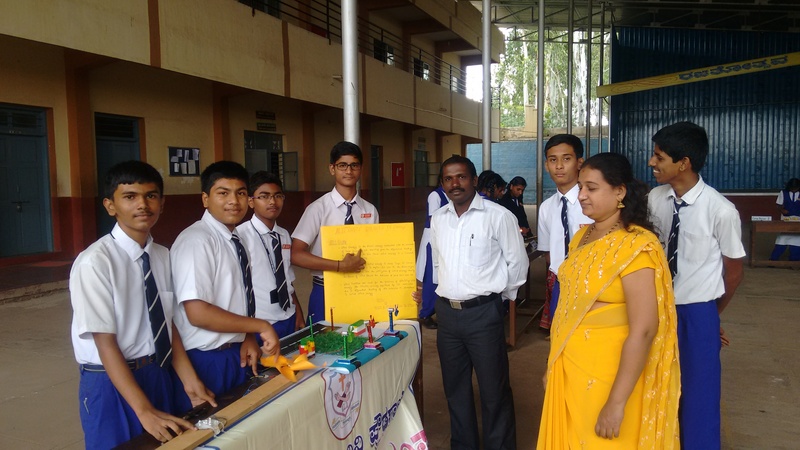 HB count detection was done by the Lab Technician Mr. Mahendra Gouri Shankar and Dilip especially for Kannada Medium Students. 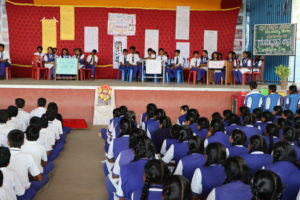 12.12.18: Drug awareness programme was conducted in our school by Kengeri Police Station personnel. 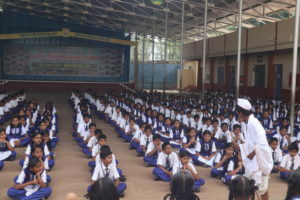 Children were given the awareness of consequences of taking drugs. 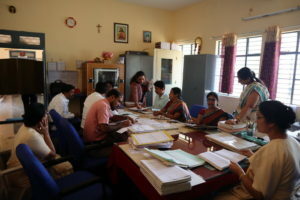 20.12.18: We had School inspection on 20th December and six subject inspectors were there for inspection. 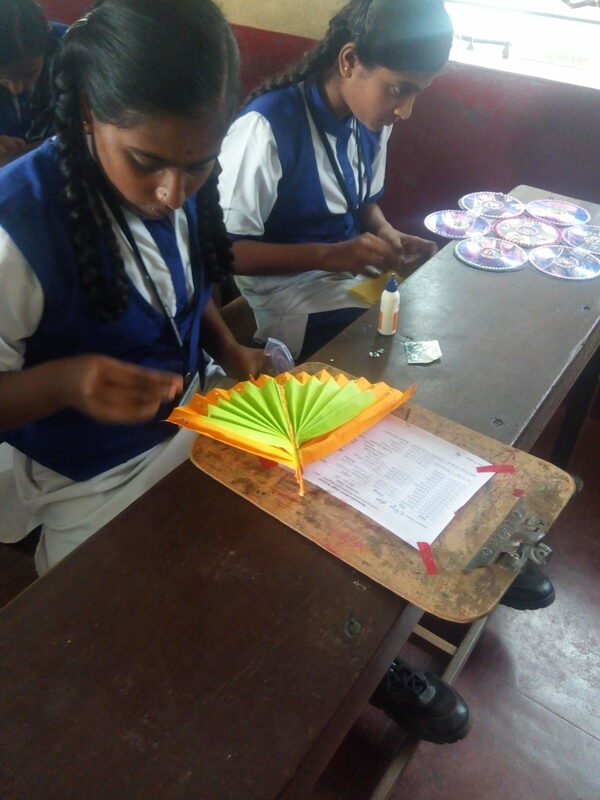 Educational officer Mr. Jayaprakash and Team made a thorough inspection of the Teaching staff and Students of the school by visiting all the classrooms and observing the teachers classes. 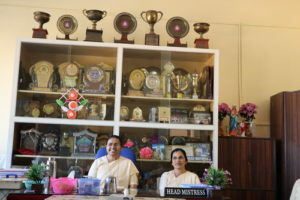 He appreciated the school Headmistress and the Staff for good environment of the School and the academic activities of the staff. He said educational efficiency depends upon the effective functioning of instructional supervisors. 21.12.18: Traffic awareness programme was given by Kengeri traffic Police Staff on 21st December in our school. 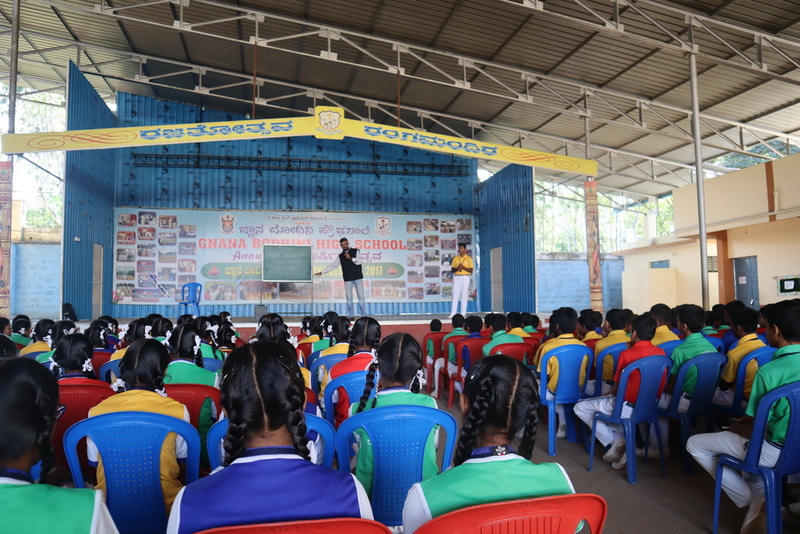 The Students were enlightened on rules and regulations of driving a vehicle and the Traffic rules. 22.12.18: Christmas is the spirit of giving without a thought of getting. 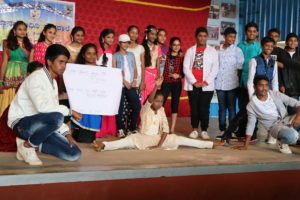 Soaking in the spirits of Christmas the students of G.B.H.S celebrated the festival on 22nd December 2018 with gaiety. 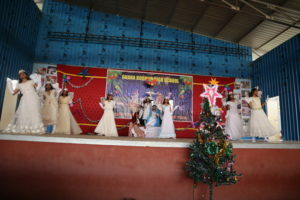 Students enacted a Tablue on the birth of Lord Jesus the savior. 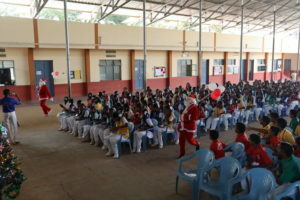 There were melodious Carols presented by the Students. Fr. 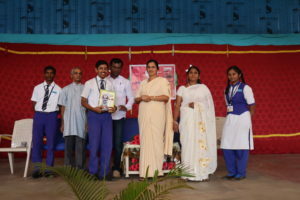 Michal Menezes, Ofm Cap was the chief guest. 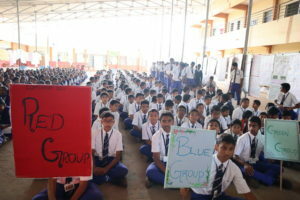 22.12.18: Post card campaign sending good wishes to our Soldiers was held in our School. 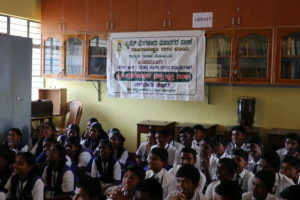 It was organized by a NGO. 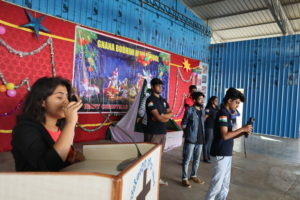 Our Ex- Students conducted this programme, to encourage the Students to salute our Soldiers, remembering their sacrifice for the Nation. 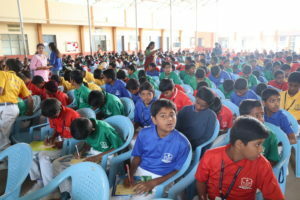 Each Student was given a post card to write a message wishing them good luck. 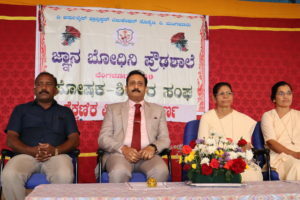 01.11.18: The 63rd Kannada Rajotsava was celebrated with great vigor and grandeur in our school on Nov 1st 2018. 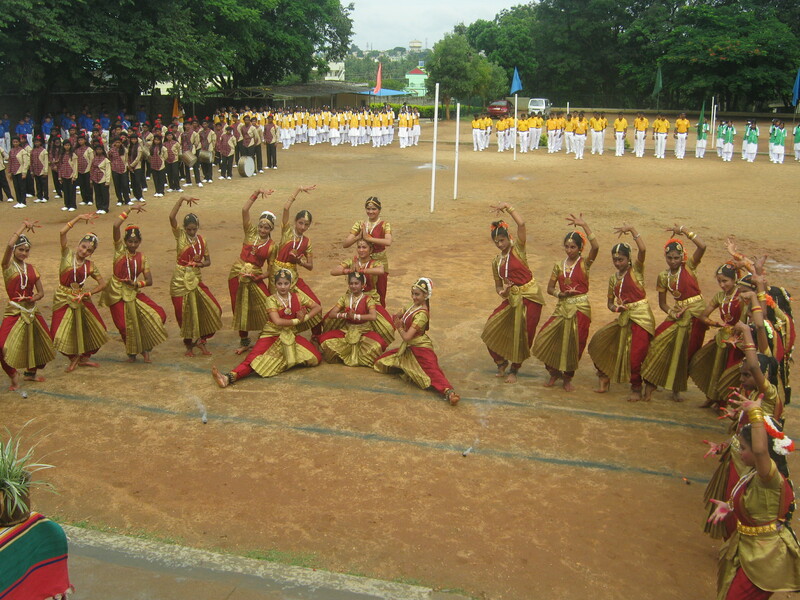 The dances added to the festive mood and originality of Kannada culture which was worth appreciative. 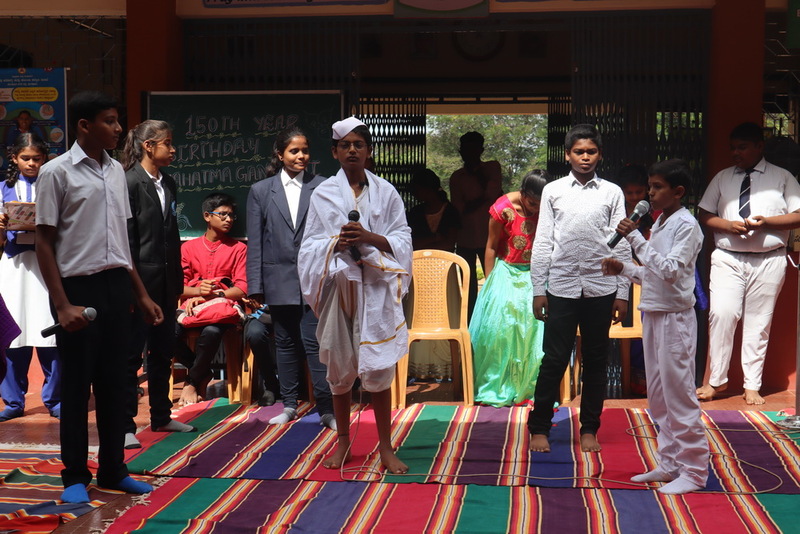 The Students put up a short skit depicting the true value as cultivating love and patriotic spirit towards one’s own state. 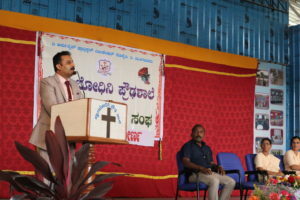 Speaking on the occasion Mr. Jeevan Muki Suresh gave a meaningful message on how to cultivate love for kannada language and culture. Old students Rakshith also was present for the same. 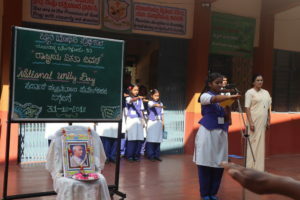 15.11.18: Children’s day was celebrated on 15th November. 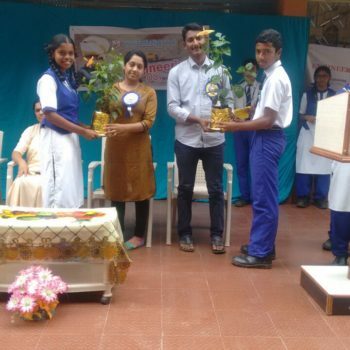 Dr. Tukaram who is our ex student was the chief guest. 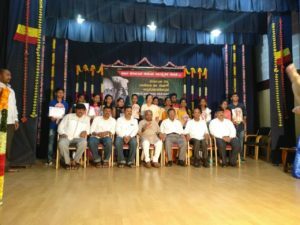 Sir Shankar Batt was present for the same. 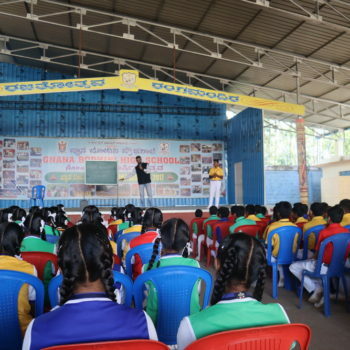 It was a fun filled day for the students of G.B.H.S. The programme began with prayer dance and tributes to Chacha Nehru.Various activities and events were organized and performed by the students. 16.11.18: The winter Parliament session was held on 16th November Friday. 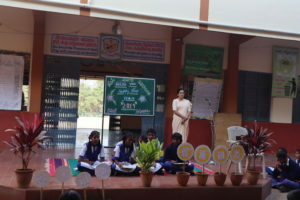 Mr Ravi and Mr. Basavaraju were judges. 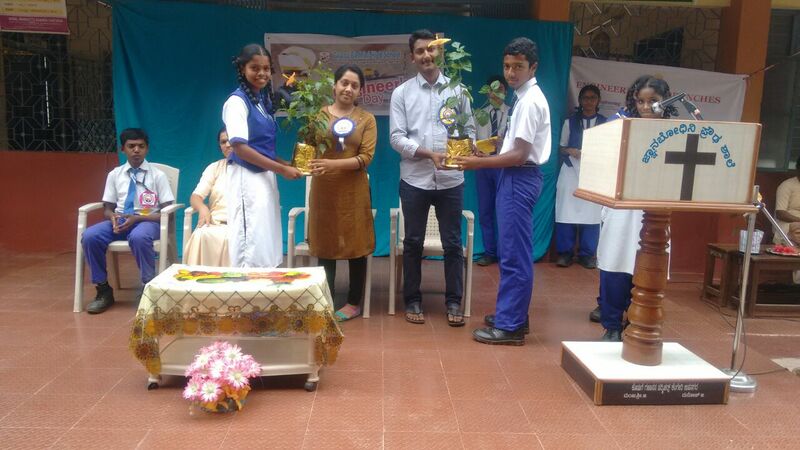 The best Students leaders were honored by the guests, with a memento. 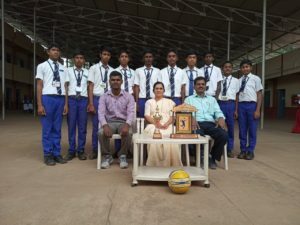 22.11.18: Vasudev Cup Volley Ball Tournament was held in Kanyakumari High School on 22nd November 2018. 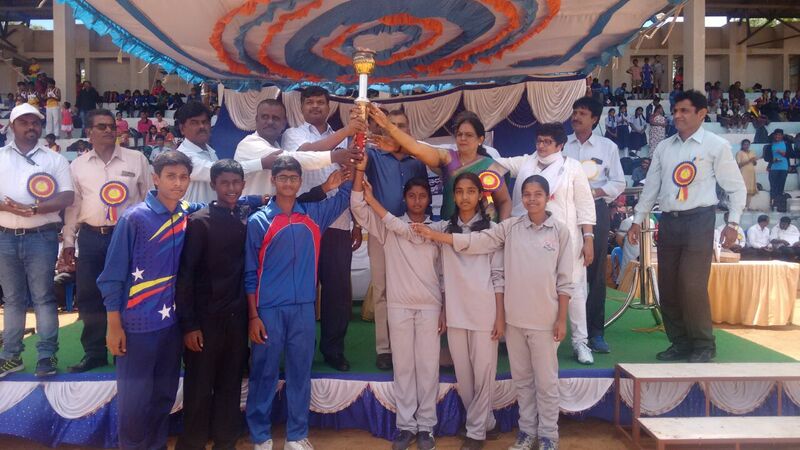 Our Students won 1st place in Volley Ball. 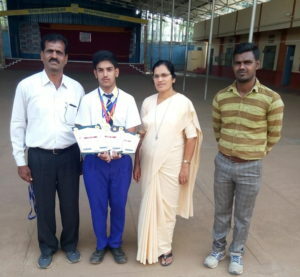 Benjamin of 9th std won the Silver Medal in Goa open Karate Championship held in Goa. 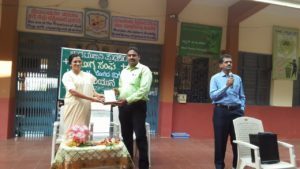 24.11.18: An insight in to the swine influenza (H1N1) Virus infection in humans was given by Dr. Manjunath who is our alumni of the School. 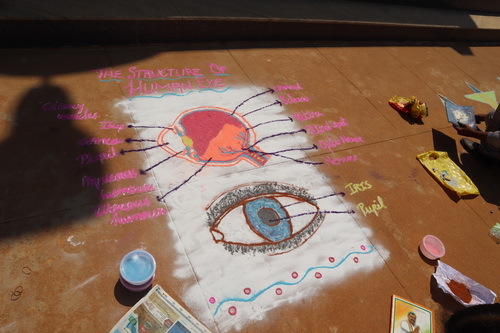 He explained the causes and its symptoms, tests, treatments and prevention of human to human transmission. 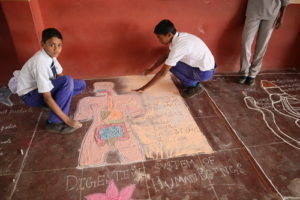 Students benefited a lot from this awareness programme. 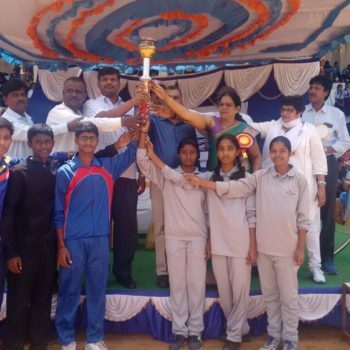 27.11.18: Physically challenged children’s Sports was organized by the department on 27.11.18. 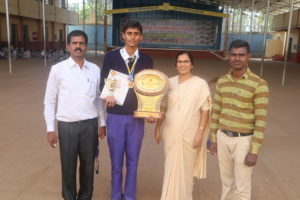 Our Student Sidharth Changappa of 10th std won three prizes. Ist in Shortput, IInd in Javelin throw, IIIrd in 100 m Race. 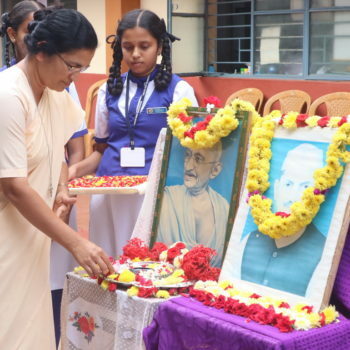 28.11.18: Kanaka Jayanthi was celebrated on 28th November Wednesday. 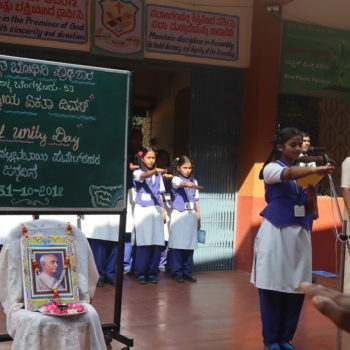 He was a poet, Philosopher, Musician and Composer from modern Karnataka. Keerthanas were sung and a small skit depicting his life was put up by our Students. 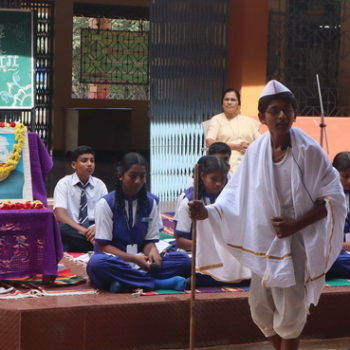 Two Students namely Rakshith of IXth A and Yashas VIIIth A made speeches on Kanaka’s life and Philosophy. 30.11.18: Constitution day also known as ‘ Samvidhan divas’ is celebrated in our School on 30th Nov Friday. 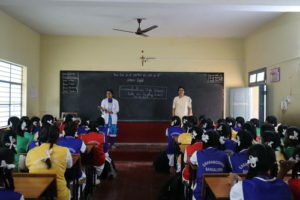 Mr Manjayya was the resource person who is the Asst Professor of Ambedkar College of Education. 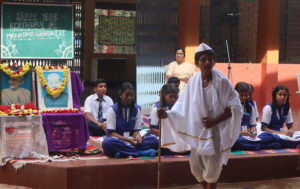 He spoke to the student about the Constitution and its salient features. 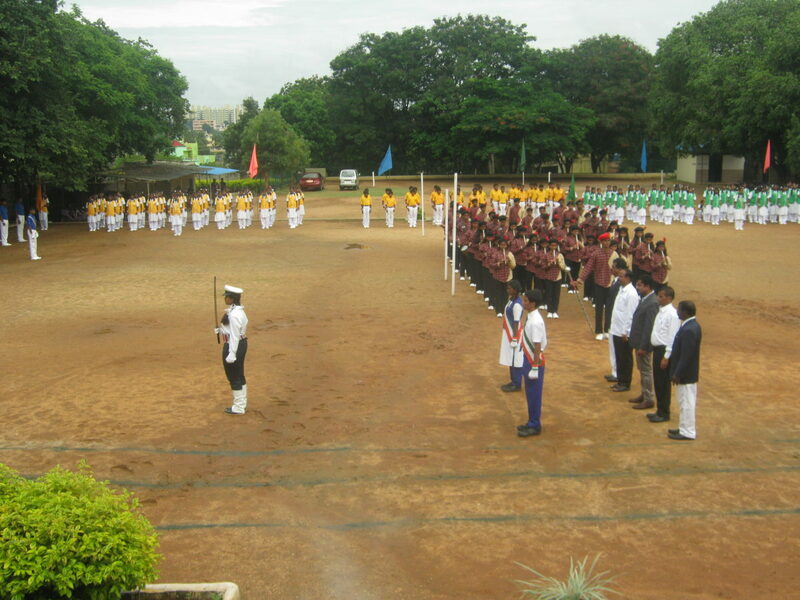 In his address he highlighted the significance of celebrating the Constitution day. 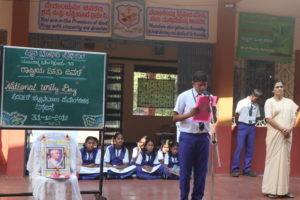 A quiz on the Constitution and Poster competition was organized. 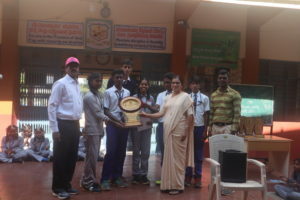 The winners were given the prizes. 02.10.2018: Gandhi Jayanthi was celebrated in a grand manner on 2nd October with a Sarva darma Prayer service conducted by Students. 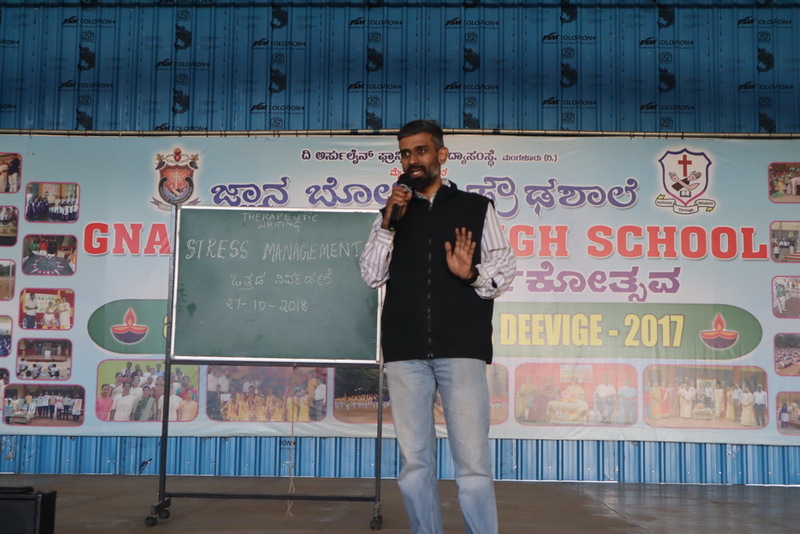 27.10.2018: The Stress management session was held for 10th std Students. 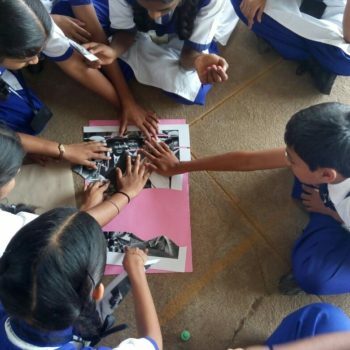 It was conducted by Mr Rajiv who owns a start-up called Sisco. He introduced about the stressors (thing which causes stress) and their effect on the body. 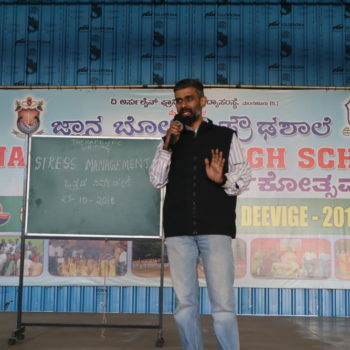 He gave ideas and motivational talk on how to manage stress and how to overcome from the fear on the previous day of the exam. 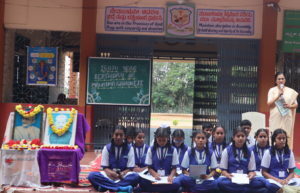 29-30.10.2018: The CSAS exam was held for 8th, 9th and 10th Kannada medium Students on 29th and 30th November. 31.10.2018: Sardar Vallabhai Patel birthday was celebrated as national unity day on 31st Oct 2018. He was the first Deputy Prime Minister of India. He was an Indian barrister and statesman, a senior leader of the Indian National Congress and a founding father of the Republic of India Who played a leading role in the Country’s struggle for Independence and guided its integration in to a united Independent Nation. 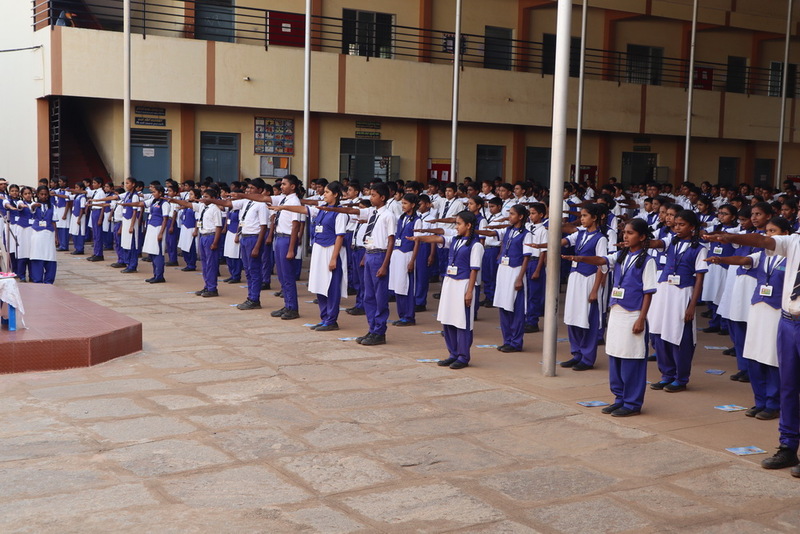 The Students took the Oath for National Unity. 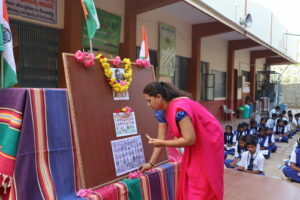 Teachers day was celebrated on 5th of September 2018. 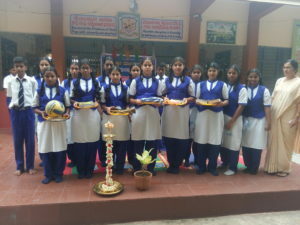 Teachers were honoured by the Students and P.T.A members. 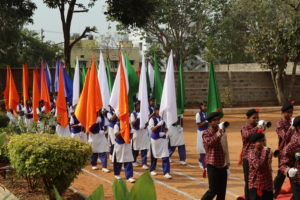 On this occasion the Students put up a very colourful program along with the lucky game. 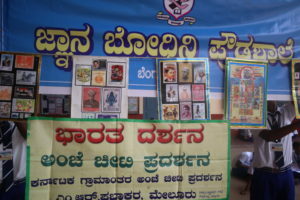 Bharath Darshan ‘ – A stamp collection exhibition was conducted by the help of P.T.A member Sir. 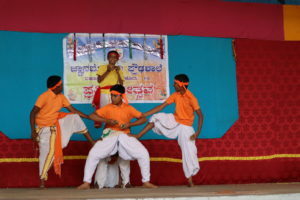 Vinod J.Puthanikar and Sri M.R Prabhakar. Sri M.R Prabhakar has a rare collection of Stamps and has conducted more than 250 exhibitions all over India and abroad and has won many awards. 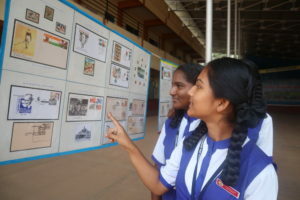 Our Students and Staff are privileged to witness such a wonderful collection of Stamps. 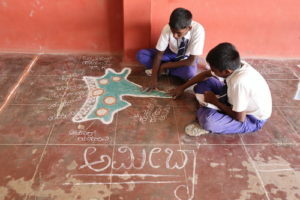 He also took classes on Calligraphy and made the Students realize how important handwriting. 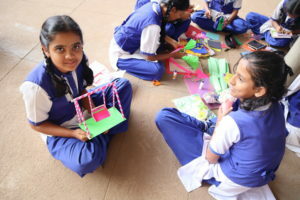 The craft competition was held for our Students. 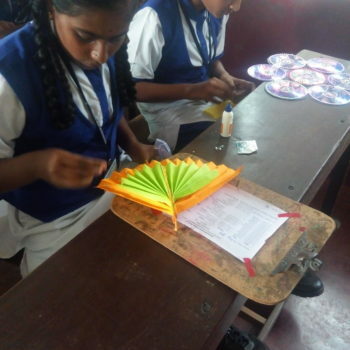 The Students were very creative in preparing beautiful craft materials. 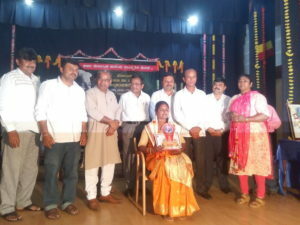 Chandana .N of Kannada Medium was honoured by the NGO Adamya Chetan of Bangaluru South on 29.07.18. 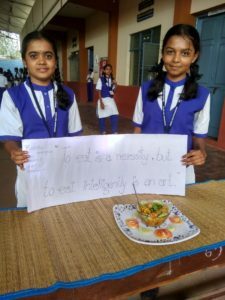 This NGO provides midday meals to our School and is run by Sri Ananth Kumar (M.P). 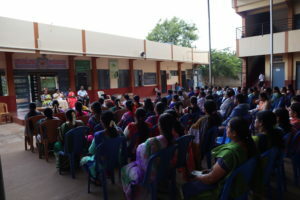 Annual General Body meeting was held. 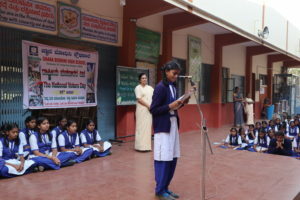 Sr Immaculate D’Souza, The Correspondent of the School Presided over the Programme. Dr.B.R. 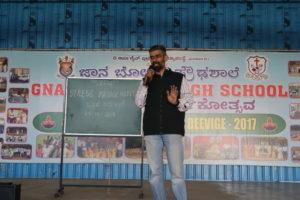 Supreeth MCA, MBA, PHD (USA) Secretary, Oxford College, Kengeri, was the resource person .He spoke on parents role in bringing up Children and to be models in character formation. 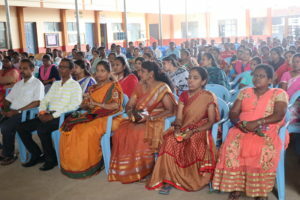 500 parents participated in the meeting. 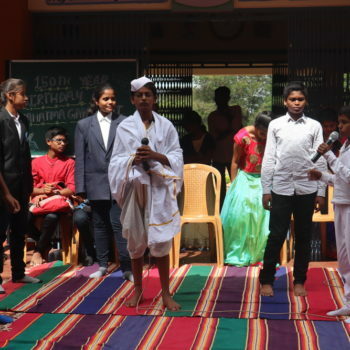 19, 21, 21.7.2018: Three days the School conducted Prathibotsava to bring out the talents of our Students. 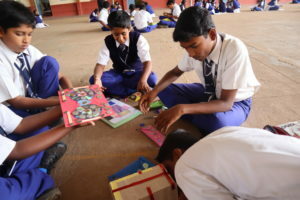 The Students had an opportunity to participate in various competitions at School level. 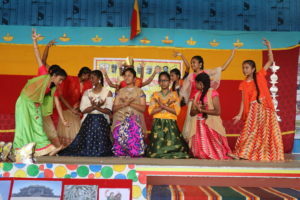 The talent show for three days had a festive look at Gnanabodhini Campus. The Teachers from other school and our old Students were invited to be judges. 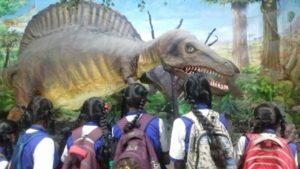 students had visited Sri Vishweshwarayya museum in the city on 8.7.2018.Around 50 Students took part in the Science club study tour. 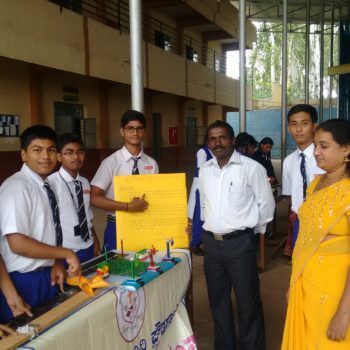 Sr. Bindu Elizabith and Mrs Kavitha the Science teachers accompanied the Students. 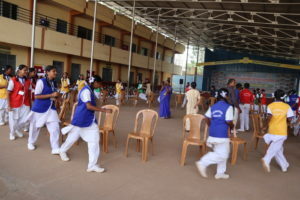 Free eye treatment was given to 15 students and free spectacles were donated to 21 students by the hospital. 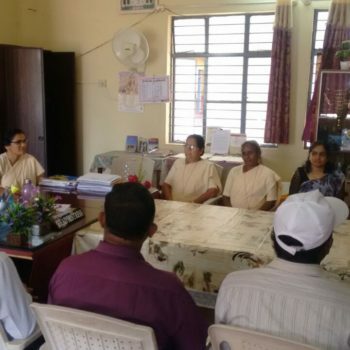 23/06/18: The parents meet of 10th std students was held on 23/06/18.The input sessions were given by the Headmistress Sr.Jacintha Pereira, The class teachers Mr Chouriraj, Mrs.Asha Suresh and Mrs Kavitha D Rao. 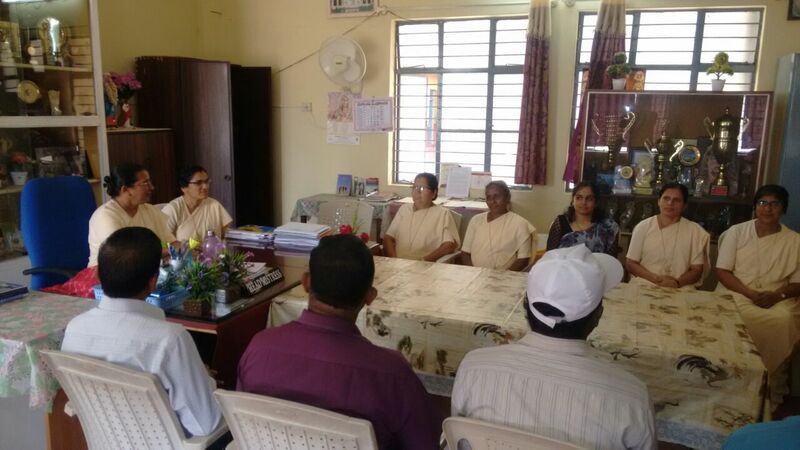 The CCE Pattern of exam, internal assessment, parents role in supporting their children to study were highlighted. 22/06/18: The school has seven various clubs. These clubs were inaugurated on 22/06/2018.Dr. 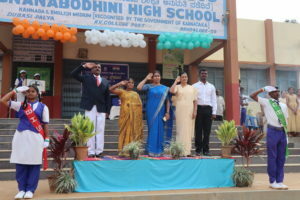 P.C.Krishnaswami, The Principal of B.PED College of physical education, Bangalore university was the chief guest. 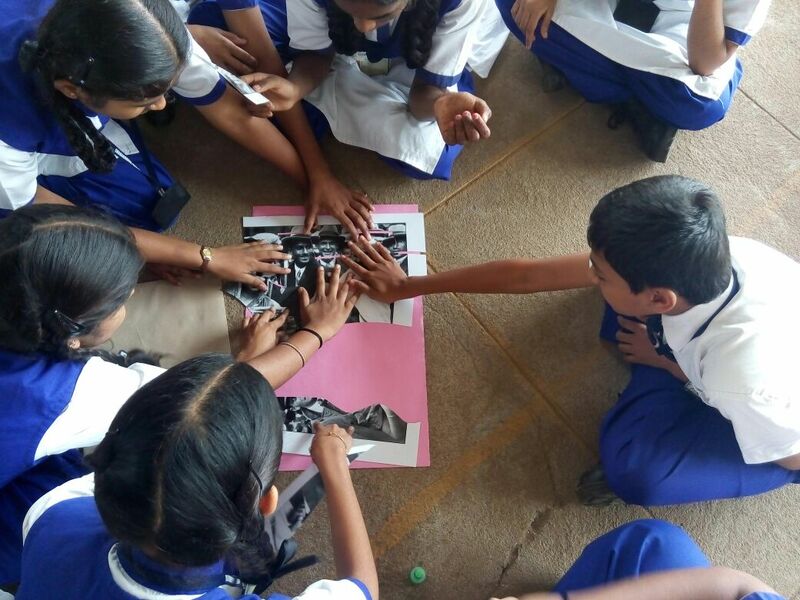 Each club introduced their aims, objectives and the activities very creatively. 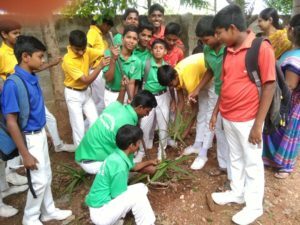 He appreciated the students and the teachers very much and invited the students to participate actively in all the club activities. 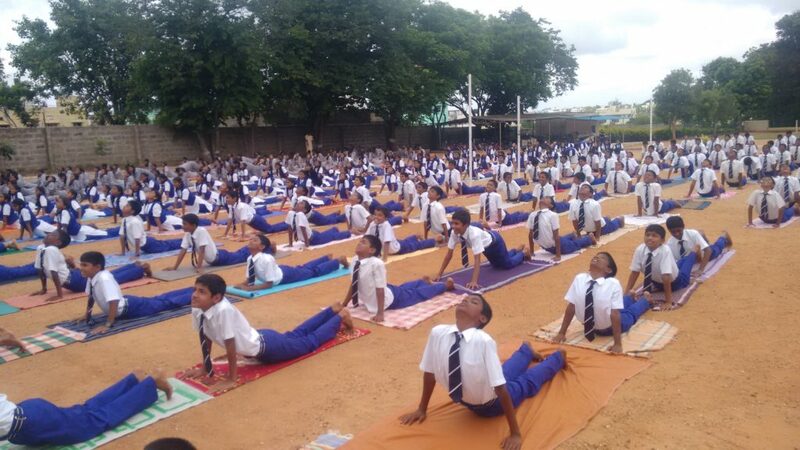 21/06/18: The international yoga day was observed on 21/06/2018.Mrs Sai Lakshmi, A yoga Teacher conducted the program and yogasanas to students. 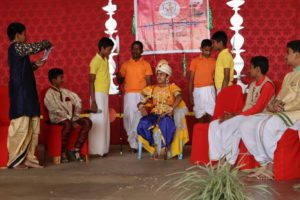 The students and teachers participated very enthusiastically. 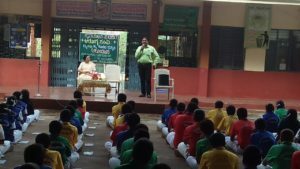 The importance of meditation and yoga for our well -being was highlighted. 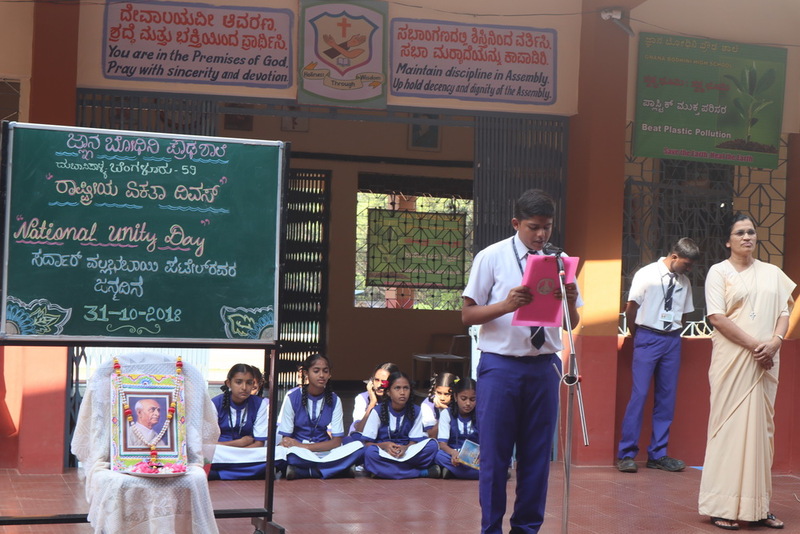 15/06/18: The school Parliament was formed and the oath taking ceremony was held on 15/06/2018.Sri Basavanna,H.M govt High school Kengeri was the chief guest. 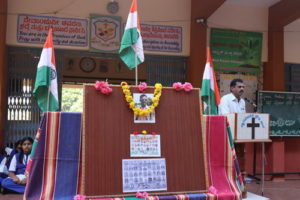 He, in his speech explained the importance of parliament in school. 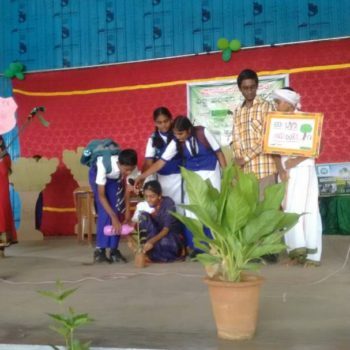 05/06/18: The world environmental day was celebrated with the short program by our Eco Club- “CHIGURU”. 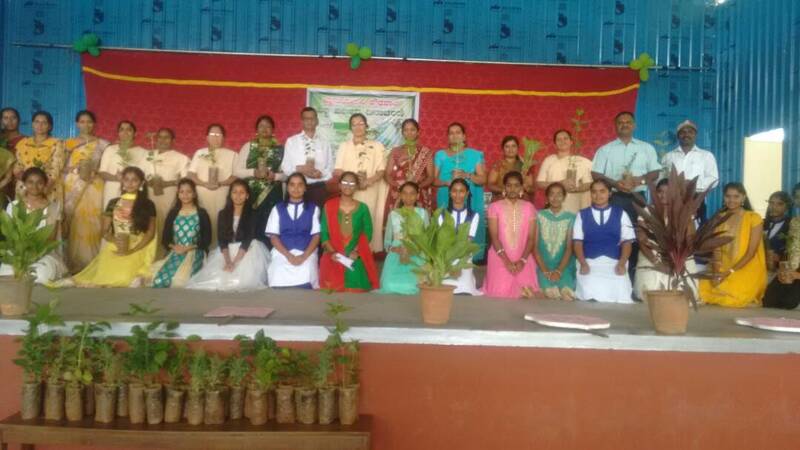 Our theme “Save the earth and heal the earth” was highlighted and saplings were planted in the campus. 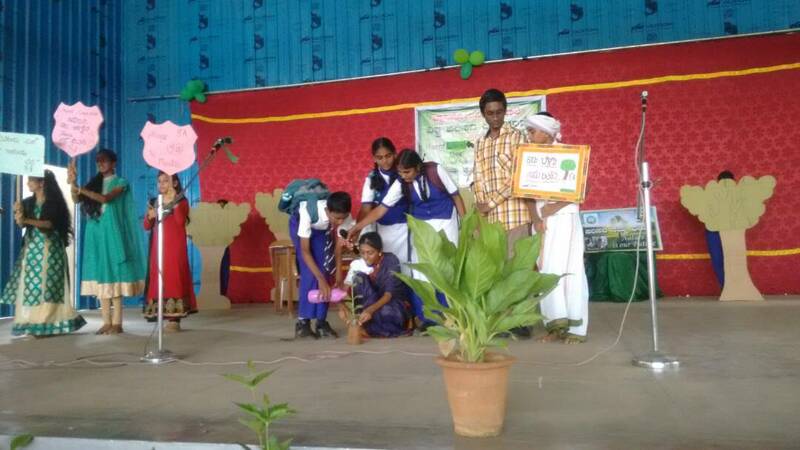 The students presented a cultural program stressing the importance to nurture the earth and avoid use of plastic. 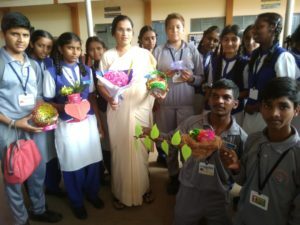 28/05/18: The new academic year 2018-19 began with welcoming the students by the Headmistress and the staff. 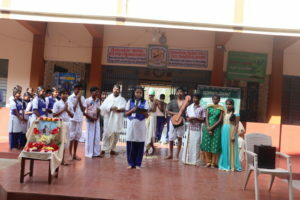 The prayer was conducted by the Students to invoke God’s blessings for the new academic year.